In all honesty it shouldn´t have surprised me, after all I seem to have a preference for shounen animes and the sports ones figure more often than not in my favorite ones – Kuroko no Basket, The Prince Of Tennis, Captain Tsubasa, Hungry Heart, Gigant Killing, Slam Dunk, Eyeshield 21, Diamond no Ace, etc.-, so liking Haikyuu! was no brainer, but…, right now I´m actually surprise for how much I love it! Between the things I love the most about this anime is that all of the characters are likable, not like in other sports animes where usually the opposite team is the “villian”. In Haikyuu there´s a real camaderie between the players -good sportmanship?-, yes they are rivals but that doesn´t make them enemies, they are just very competitive and are having fun playing against each other. Also all of the characters -even those that have only made one apperance so far- have unic and fun personalities as well as some development. The story, the premise of the story is very simple and also something seen in lots of sports animes, where the team wants to go to nationals, be the best, etc. In Haikyuu´s case this is basicaly it, go to the Tokyo tournament, win, be the best, return Karasuno to it´s former glory, making it again the volleyball team that it was once. An it´s a slow process, as much as my brother and Iwould love Hinata trashing everybody and owning it like no one else, it´s actually fun and refreshing to actually see a learning and evolving curve. The majority of the sports animes simply have their characaters develope amazing skills faster than a digimon´s evolution or right out skip this step -some characters seem to be the best and that´s it-, but not Haikyuu. At the begining of the story, Hinata posses great fisicality, reflexs and speed but he lacks the experience and technique; Kageyama has the skills and technique but hasn´t develope them, isn´t really a team player and is in need of a better gme understanding, A it isn´t only thi two, the team as a whole and even their rivals have things to improve. The animation hasn´t it gotten unbelievablythei better? !, specially during season 2, the Hinata and Kageyama fight back in episode 5, was truly heartbreaking but the whole thing was so beutifully animated and put together that I cannot help but love that scene, the music, the coloring, the voice acting and expresions on the characters, all came together to make one of the most emotional and best animted scene I have ever seen, The fact that they even included Hinata´s and Kageyama´s reflexions on the floor, that´s really some atention to detail. Hinata and Kageyama, I Have heard lots of people said that the key to every sucessful story is to have a likable protagonist, but most of the time I find out that I don´t particularly like the main character, in fact the majority od of my favorite characters are the best friend, antagonist or support character, etc., –Killua, Sunagawa, Stiles, Bellamy, Felicity, Hiei…- , but in Haikyuu I love Hinata!, he´s adorable and cool, fierce but kind of a scary cat, selfish but well intentioned, confident but insecure; he´s a big contradiction of himself. Kageyama on the other hand seems selfish but I think he is more selfless, hard hearted but in reality is a softy, can come across as over confident but I think he second guesses himself more than Hinata and in a way I think he´s really selfconcious. The two of them are hilarious and great aparte bt when you put them together, their like a dinamic-comedic- duo thet really works out. I can totally imagine this two going to college together and taking the volleyball world in a storm, ´cause even if those two volleyball idiots don´t consider themself friends, I think they are best friends, they certainly have enough things in common and differences to make it a compelling frienship. 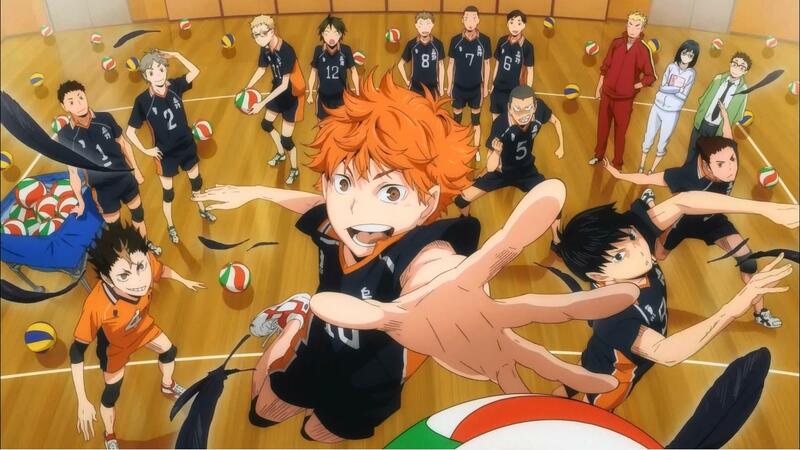 Anyway… Haikyuu is without doubts one of my favorite animes right know, I dont miss and episode ever, it´s one of the few animes that I watch with my brother -a non anime lover- that we both enjoy and can´t have enough of. It might not be in Slam Dunk´s or even Kuroko no Basket´s league yet, but this is a small giant that´s surely going to make it into the best sports animes that exist. Have you seen Haikyuu? Do you like it as much as I do? Which are your favorite sports animes? This entry was posted in Streaming and tagged Anime&Manga, shounen by jewelgeekyshelf. Bookmark the permalink.